My dad passed away last night. I'm not going to get too personal here, I hate "personal" blogs, but I just want to say that I am who I am because of my dad. My dad worked for General Motors. He lived the American Dream. He started off in their accounting department and retired an executive. He retired at age 55. He spent the last 24 years of his life taking it easy, golfing, doing as he pleased. He was a loyal GM guy. But he was also a car guy. I grew up on Long Island in a town called Huntington. About 10 or 15 miles south of where we lived, on the corner of 25A and Rt. 110, was a British car dealership. They sold all things British. (Except for Lotus, whose dealership was a little further down 25A.) I can't remember the name of the place. (Competition Motors, maybe? Sportique? Both of those ring a bell.) Every other weekend or so, we'd take a ride there. I was very young, but I could tell he wanted a Healey 3000 or an XK-E. When I was a older I asked him why he didn't buy one. He told me that he would have liked to, but it wouldn't have looked good for a GM guy to be seen driving a non-GM car. Each year he took me to the NY Auto Show. We'd go the day before it opened to the public. I had all the time in the world to look at the cars. Those experiences, the discussions we'd have about cars and all the "car stuff" he'd bring home from work, got me interested in cars. Someone else gave me the "Car Geek" name, but it was my dad who started me down that road. Whether he knew it or not, he was the OCG - Original Car Geek. I'm not a spiritual person by any stretch of the imagination, but, if there's an afterlife, my dad is cruising around somewhere right now in a Big Healey, with an E-Type waiting for him in the garage. I am so sorry to hear of your loss.By recognizing the positive influence your dad had on you, you will also come to see that you do not really write your blog alone.He may not be helping you with spellcheck, but the guidance is is undeniable. If he made you who you are, he must have been quite a guy! With sympathy and thanks for all you do! My sympathies on your loss. Words are small solace at a time like this and surely I do not have the skill to come up with better ones. all that I can say is that even though your dad has passed is that he always will be with you. May he rest in peace and may you and your family find peace as well. My condolences. 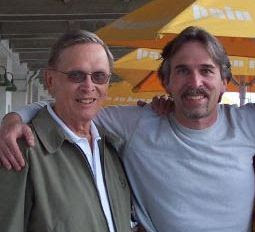 Thanks for prompting me to remember the good times my dad and I had (and still have). You have my greatest sympathy and condolences. Your dad gave you a better-than-front-row seat when GM ran the circus. They basically ruled the world. Back then, even the divisions within GM were like sports teams. You had your Vetteheads, Buick guys, GTO fans, and even Dr. Oldsmobile. Every year the NFL met the AFL when Car and Driver (or Motor Trend) pitted the latest Camaro against the latest Mustang. While you dad never got around to buying a Healey, I'm sure he got a real kick out of your choices in cars. It's not like you ever drove boring plain vanilla appliances. Your dad turned what would many would consider to be "mere transportation," into Culture. That alone is priceless. You can't buy culture. It has to be taught. Very sorry to hear about your loss. Sounds like your father was a very interesting guy, you are lucky to have these good memories. I'm so sorry to read this... sounds like he guided you in the right direction, though, and I'm sure he'll live on in that way. I'm sorry to hear about your dad's passing. You seem to have a great memory of the good things in life, so I think he'll be around as long as you are.